Scrum is ideally a project management methology which works best for rising and emergent companies and works, but is mostly used for software development. This means that instead of giving detailed description of how a job is done and how a problem is solved, Scrum has talented team members who develop how to tackle the issue in the cleverest way. It started off in 1986, when Scrum was created as an agile, holistic and flexible approach to project management rather than a sequential manner. This was created with the intend of keeping the whole of the team work responsible for the decision and the problem solving process and accepting an being ready to any type of flexibility. This approach was widely appreciated and started gaining momentum in the project management business. Product owner is in every way the voice of the customer. He is responsible for voicing the customer’s problems, needs, requirements and communicating with the customer as well as other team members about the work. Product owner’s work is very much related to be a good coordinator, it doesn’t matters if he as a big team beneath him or not. He is pretty much the project coordinator. Development team is basically a team of 3-9 workers who are constantly working to keep the entire scrum team organized. They are responsible for increments, listing and dispatching of their products the team needs for any task. Scrum master of any team is an unconventional head of the task. He leads his way and ensures that the work goes down smoothly and successfully. Her supervises the entire task and is makes sure that all the work in the team is done perfectly to reach a certain goal. A “sprint” is the basically the time or duration each task takes to complete. Each new work is started with a “planning” which allows all the team members to properly brainstorm and decide which the best way to do the current work is. Every day as a ritual all the team members do a 15 minute morning meeting, also known as the “Daily Scrum”. They discuss about the milestones achieved yesterday, what they intend to do today and how will their decisions help the project forward. 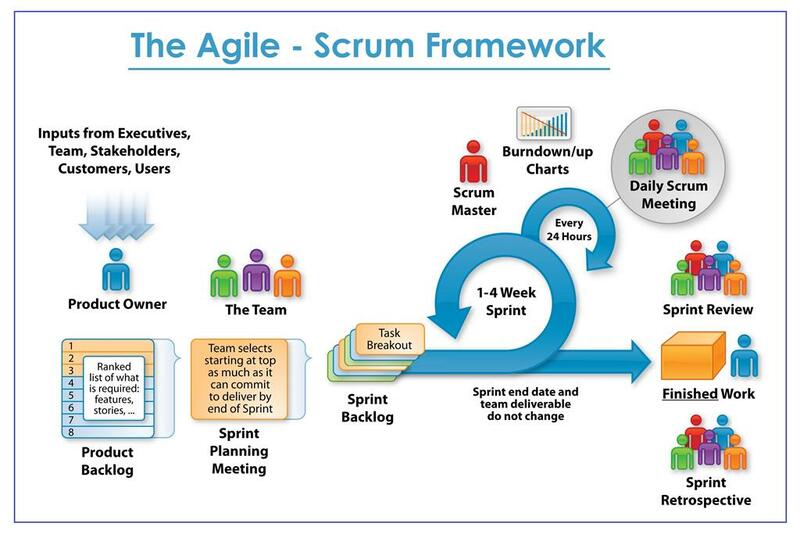 The daily scrum is done every day at a fixed time with all the members those who are there at the moment. After the end of any project there is a “Scrum review” and “Scrum retrospective” in which they review the work, reflect on it and identify any areas they find they should improve on. Scrum is an excellent way of project management for its organized manner and flexibility and allowing openness to all the team members instead of letting only the heads take the major decisions.